↑ "INF Treaty". United States Department of State. สืบค้นเมื่อ 4 October 2018. ↑ Kramer, Andrew E.; Specia, Megan (1 February 2019). "What Is the I.N.F. Treaty and Why Does It Matter?" – โดยทาง NYTimes.com. ↑ Stockholm International Peace Research Institute (2007). SIPRI Yearbook 2007: Armaments, Disarmament, and International Security. New York, NY: Oxford University Press. p. 683. ISBN 978-0-19-923021-1. ↑ Pengelly, Martin (20 October 2018). 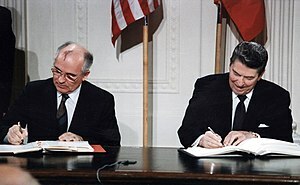 "Trump says US will withdraw from nuclear arms treaty with Russia". The Guardian. สืบค้นเมื่อ 20 October 2018. ↑ "Pompeo announces suspension of nuclear arms treaty". CNN (in อังกฤษ). สืบค้นเมื่อ 2019-02-01. ↑ "Russia suspends INF treaty in 'mirror response' to US – Putin". Russia Today. 2 February 2019. สืบค้นเมื่อ 2 February 2019. หน้านี้แก้ไขล่าสุดเมื่อวันที่ 14 กุมภาพันธ์ 2562 เวลา 23:20 น.